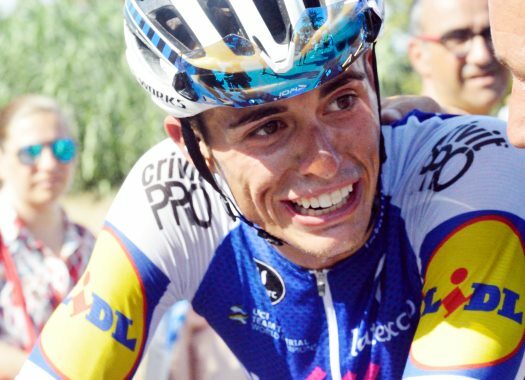 Enric Mas (Quick-Step Floors) took the victory at the 20th stage of the Vuelta a España. The Spaniard was part of an escape on the last climb and crossed the finish line ahead of Miguel Angel Lopez and Simon Yates. The penultimate stage of the Spanish grand tour was the last mountain day of the race and took the riders through a 97.3-kilometre course between Escaldes-Engordany and the Coll de la Gallina featuring three climbs of the first category, one of the second, one of the third and a final hors-category ascent. The stage started with several attacks of riders like Vincenzo Nibali, Thomas De Gendt, Michal Kwiatkowski, and Bauke Mollema, among others. At the second ascent of the day, Mollema attacked and was followed by some of the front group and then it was De Gendt's turn to attack and behind them, Mollema, Rafal Majka, Michael Woods, Nibali and Kwiatkowski went to chase him. In the peloton, there were also attacks of riders like Nairo Quintana, Gianluca Brambilla and Mikael Cherel, but Mitchelton-Scott took the role in front and reeled them back in. At the front, a new group that came from the peloton joined the front. Right after they reeled De Gendt back in, and Jesus Herrada (Cofidis) made a move to build a gap with the others. With 38 kilometres to go and at the last first category climb of the Coll de Beixalis, Astana made a move from the peloton and two riders took Miguel Angel Lopez with them. Meanwhile, David de la Cruz (Sky), Majka (Bora-hansgrohe) and Mollema (Trek-Segafredo), took the lead of the race. At around 34 kilometres to go, Lopez was taken to Mollema before being left on his own and the two of them were joined by Nibali. Metres later, Lopez got to Majka and de la Cruz, but then they were also joined by the favourites' group. At the descent of the Coll de Beixalis, Quintana launched a new attack and built a gap with the chasers. Moments later, Lopez attacked and got to Quintana. The two of them continued and created a gap of around 20 seconds with the rest. Behind them, Simon Yates decided to change the pace to catch the front men and Enric Mas (Quick-Step Floors) stayed at his wheel. At the end of the descent, the two men caught the duo at the front and they continued together until Quintana reduced the speed at the start of the last climb to help Alejandro Valverde on the ascent. Lopez and Mas kept going on their own as Yates set his own pace for the climb behind them. With four kilometres to go and as they approached the hardest part of the climb, Valverde had trouble keeping the pace and got dropped from the group. Kruiswijk also had trouble maintaining a good rhythm and was left behind by Rigoberto Uran and Thibaut Pinot. He too lost his spot on the podium. Mas was the fastest at the final sprint and with this victory climbed to the second spot of the general classification. Lopez was second on the stage and climbed to the third step of the final podium. Yates crossed the line in third place and consolidated his victory in the race.